The image above is from Monticello’s July 4th ceremony. There is no more inspirational place to celebrate the Fourth of July than Monticello, the home of the author of the Declaration of Independence. Since 1963, more than 3,000 people from every corner of the globe have taken the oath of citizenship at the annual Monticello Independence Day Celebration and Naturalization Ceremony. 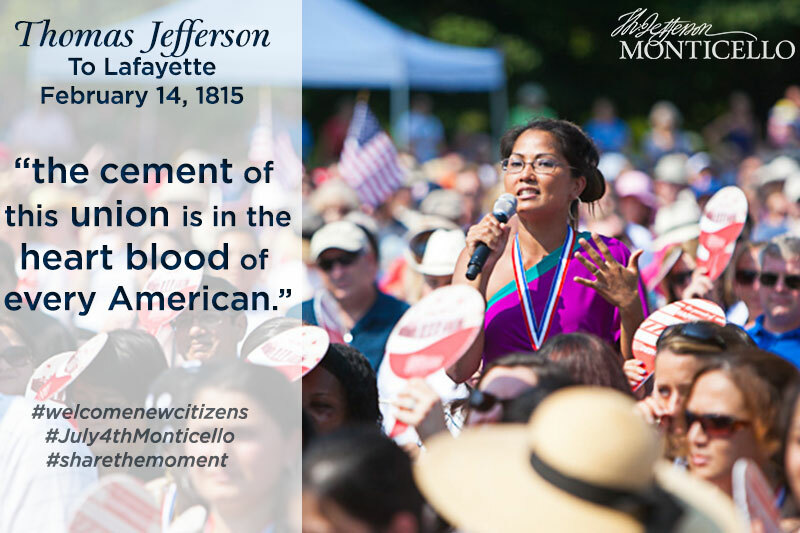 We hope you will join us at 9 am for the 52nd Annual Independence Day Celebration and Naturalization Ceremony on Monticello’s West Lawn — one of America’s most moving July 4 events and the largest naturalization ceremony held outside of a courtroom. The ceremony will include remarks by David M. Rubenstein, co-Founder and co-CEO of The Carlyle Group, and patriotic music by the Charlottesville Municipal Band. Christopher Job, of the Metropolitan Opera, will sing the National Anthem and America the Beautiful.